Every financial year, Indians with taxable income, or even without, are required to pay income tax and even those in their 80s and above are not exception. But for them the rules are little relaxed and they can file ITR online as well as offline. Super senior citizens often require assistance while filing returns. Find out the tax rates and provisions applicable to them here. Who is a super senior citizen? According to the Income Tax Act, 1961 a super senior citizen is defined as an individual, who is a resident of India and whose age is greater than 80 years, as of the 1st of April of the financial year. C) No ownership of foreign assets. If total income is greater than Rs.500000 but less than Rs.1000000: Tax rate of 20% is applicable on the amount by which income exceeds Rs.500000. If total income is greater than Rs.100000: Tax rate of 30% is applicable on the amount by which income exceeds Rs.1000000. If total income is greater than Rs.5000000 but less than Rs.1 crore: In addition to a 30% tax, a surcharge of 10% is levied. Please note that the surcharge levied is subject to marginal relief. This means that when income is greater than Rs.1 crore, the total amount due as surcharge and income tax cannot be greater than the income tax due on the amount by which the tax payer’s income exceeds Rs.1 crore. Under Section 87A of the Indian Tax Act, an individual whose income is less than Rs.5,00,000 , can claim a rebate of Rs.5000 or 100% of income-tax (whichever is less). 1) Super senior citizens are exempt from filing e-returns even if their total income is greater than the exemption limit: As of assessment year 2015-16, super senior citizens are not required to file their income tax returns electronically. Prior to assessment year 2015-16 any individual with income exceeding the exemption limit was required to e-file their income tax returns, irrespective of seniority. However, the procedure has been changed keeping in mind that some super senior citizens may not what the technology/the technical expertise required for e-filing. Thus, super senior citizens filing income tax returns using ITR Forms 1/2/2A can file their returns physically. 2) Super senior citizens can claim deductions for medical expenses: Super senior citizens can claim medical expenses up to Rs.30,000 as deductions from their total income. 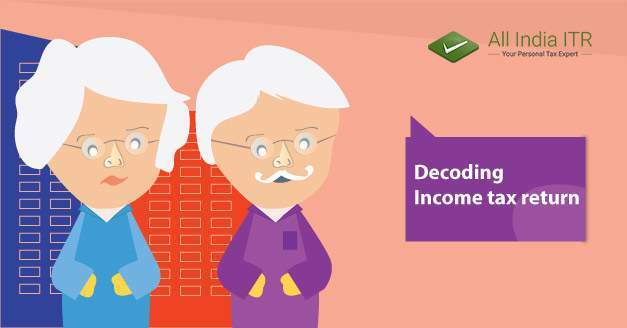 Thank you for your great article .It is the clearest i have found and i am sure it is going to help me a lot as a common Indian citizen.This blog take initiative to give more and more information and tips about decoding income tax return for super Senior Citizens which were not known by most of the people .It’s really great that u take initiative to tell people about this and your way of representation of thought is really good.Great work by ITR team it really nice to explain everything about taxes. It touches each and every corner of tax and its related branches in a neat and aligned manner.All India ITR experts solve my problem in simple way.